**** Chosen by Winner: Cory H.
Jeff Knox has once again created a conversation piece,his "Dino" art knife that captures the eye and imagination. 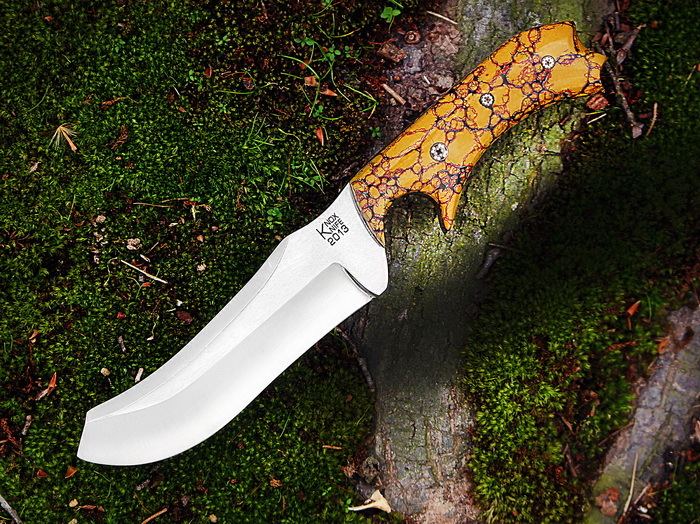 The full tang, 1/4" think creation features a uniquely shaped trailing point highly polished, hollow ground 440C stainless steel blade that contrasts with the brightly colored stabilized dinosaur bone scales held with mosaic pins. As the son of Tom Knox, a historical firearm collector, who is the President of National Automatic Pistol Collectors Association, I grew up playing under the tables of all of the collectors at the gun shows. Although I’ve always collected guns, I’ve always had an eye for the unusual, the intricate, and or clandestine blades. After years of collecting military knives, OSS special weapons, sword canes, etc., I discovered this little known website in the late 90s called ebay. Ebay brought Mr. Gil Hibben to my attention. I was awed and inspired by his work. I found his website, called him, he answered…and I hung up. After wondering why a guy like this doesn’t have a secretary I called back. Within a year, and after visiting the Hibben shop several times, I took my first knife making class and as Gil said it would, the class changed my life. That class became a defining opportunity for me. I finally got to experience the work and craftsmanship that goes into designing and hand crafting a blade. 14 years later I have my own shop where I create whatever I dream up. I have a Tops knives knife being produced and I am manufacturing 2 product lines: www.Babyknucks.com – baby sized brass knuckle/key ring/bottle opener “because day care can be a rough place” and www.Puppyknucks.com pet ID tags for the big dog in every dog “Recommended by 1 out of 1 veterinarians, that I know”.